Important: remember you can change your Free plan Bitrix24 account name only once. You will see your new account name in the left top corner & inside web url. In order to change your account name again (more than once) or give it a 3-rd level domain name (e.g. mycompany.bitrix24.com) - you should have a Standard or Professional plan subscription. 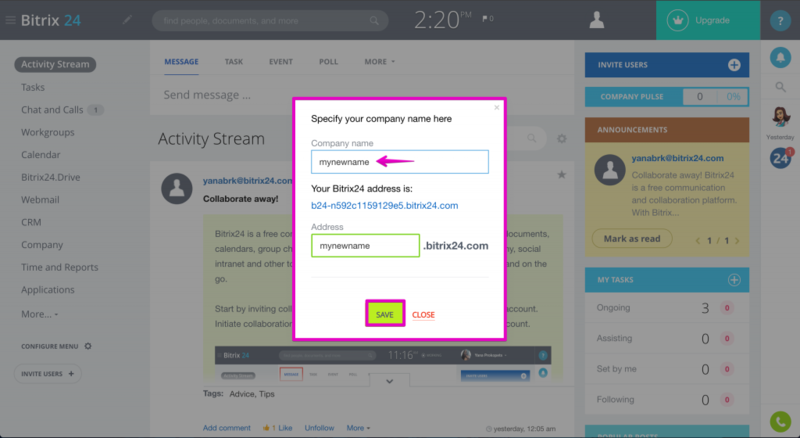 If your Bitrix24 account has the custom name already, but you want to change it, please read below. Bitrix24 Standard & Professional plans subscribers can change the first half of their 3-rd level domain names, e.g. 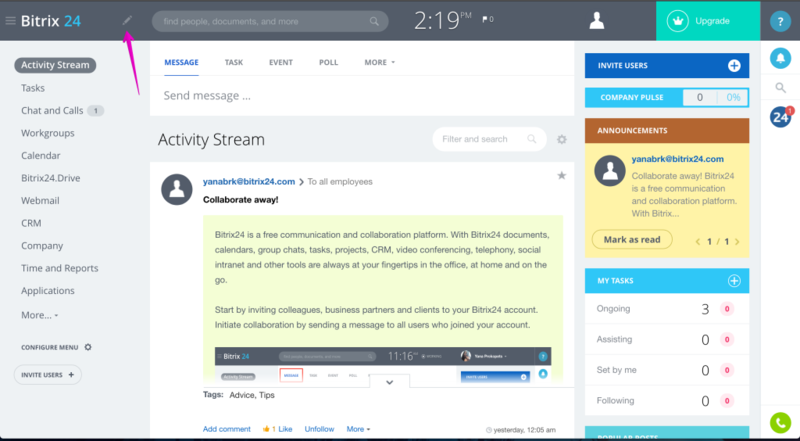 from test.bitrix24.com to mycompany.bitrix24.com. If you are our paid plan subscriber - you can contact our Helpdesk with this request (the only thing you have to provide in your ticket is your old domain name & the name you want to have). Please note that this option is available to Bitrix24 Standard or Professional plans subscribers only. 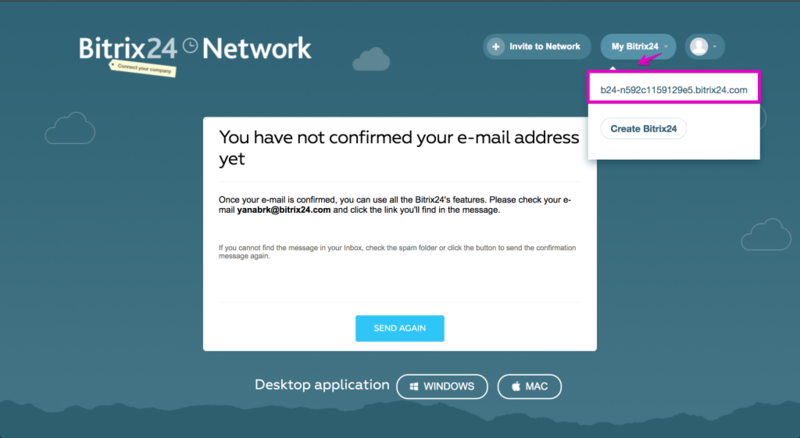 If you are Bitrix24 free plan subscriber - the only solution we can advise if you want to change your domain name is creating a new Bitrix24 account from scratch & abandon your initial Bitrix24 intranet, it will be automatically deleted after 40-50 days of inactivity (just do not log in). If you already have your own website domain or you want to purchase one, you can use the 'Own Domain name' service. 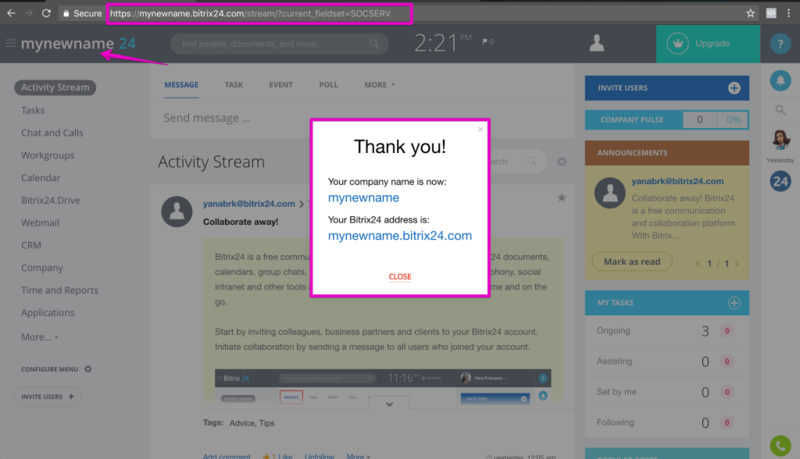 This feature is available for Bitrix24 Professional plan subscribers only and allows you to change the name of your Bitrix24 account to your own 3-rd level custom domain name, for example: company.bitrix24.com to my.company.com. 2. Buy a 3rd-level domain (my.company.com) or higher. Why 3rd-level domain? The reason is that if the lower level domain is bound, you won’t be able to configure all required settings and use all Bitrix24 options and possibilities. (Even if you have sent us certificate keys for the 2-nd level domain, you need to send all data listed above for the 3-rd level domain anyway). Please note that SSL certificate is a mandatory condition. SSL is used to protect the data over the Internet. It guarantees a secure connection between the server and the user's web browser. With SSL the data flowing is encrypted over HTTPS, and decrypted with a special key only. For the browser not to display a domain non-conformity message (.bitrix24.com, .bitrix24.de & .bitrix24.ru certificates are installed by default), it must be purchased separately and sent to us (we will conduct the appropriate settings at our side). SSL certificate must be issued by CA. Self-signed certificates will not work. Certificate chain up to CA root is mandatory. If the certificate expires, please send a request to technical support to renew it. Otherwise, after the certificate expires, the domain name will be immediately changed to the original one. 5. Please specify the correct name of your domain that you want to be used as your Bitrix24 domain name (e.g. my.company.com). 6. After you've provided all the required information (SSL certificate and keys), Bitrix24 Support will send you four "IN NS" records. You need to add these records to your DNS. We provide only this type of records. We don't provide IP-, CNAME- or any other types of records. If you have any problems adding these records, please contact your domain name registrar. If your domain registrar cannot add "IN NS" records, you need to change the domain registrar.